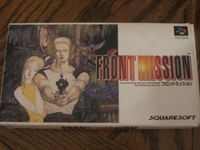 "Front Mission (フロントミッション Furonto Misshon) is a turn-based tactical role-playing video game developed and published by Square in 1995 for the Super Famicom. Front Mission is an ongoing saga intertwining the storylines of various heroes and their battles involving mechs. The games feature a very broad range of mech customization, where each individual part of the mech can be tweaked for the greatest possible performance." Source: Wikipedia, "Front_Mission_(video_game)," available under the CC-BY-SA License.